This entry was given to the interviewer through digital means. The interviewer asked the informant, Sahit, about any superstitions in the NBA he knows because of Sahit’s die-hard obsession to the sport. He replied with a comment about the “winningness” of the Golden State Warriors. The interviewer had heard about the “Toaster Era” but didn’t know what it was attributed to in the first place. More than anything, this whole thing seems like a passing meme about the Warriors’ insane ability to win against any team in the NBA. I really doubt that the Warriors are undefeated solely due to the toaster, but it is nevertheless entertaining to think of this superstition as a reason for their repeated victories. This entry was given to the interviewer through digital means. The interviewer asked the informant, Sahit, about any superstitions in the NBA he knows because of Sahit’s die-hard obsession to the sport. He replied with a postseason ritual that he knows Lebron James does. The interviewer keeps up with the NBA himself but didn’t know about this admittedly arcane postseason ritual Lebron goes through. He also finds it a little hard to believe that Lebron does this every time he makes it past the regular season because it tends to happen every year recently. Regardless, it is entertaining to know that even NBA stars are subject to some superstitions about their game. This entry can loosely be described as videogame folklore. The interviewer (D) and the informant, C, were playing a game called Super Smash Bros for the Wii, a widely popular fighting game with well documented analysis for every character, stage, and since two players tend to face each other from a list of characters, every potential matchup as well. There are many unwritten rules that players follow to observe proper “etiquette” when playing the game. The game is played with 4 lives “stocks” and set to an 8-minute timer. The first to force their opponent to lose their stocks is declared winner. It is proper tournament etiquette to fistbump before games start. This interaction occurred after both players had chosen their characters for the next game. The process of “striking stages” happens in order to preferentially pick stages for the next game to happen on. The interviewer notes the gesture of fistbumping as an unsaid mutual agreement that both players can proceed to the next match. There are no explicit rules stating players must fistbump to play the game, of course, but even in friendly play this simple gesture indicates you have a working level of respect for your opponent. It conveys a “no hard feelings” attitude that works for both parties, winner or loser. 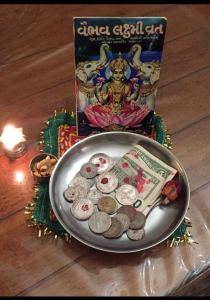 Every year before Diwali, the informant’s father, M, conducts a tradition where he honors the goddess Lakshmi for the wealth and prosperity that he has received throughout the year. The tradition is at once meant to thank her for past blessings and to ask for for more as the next year approaches. The tradition demands that some money be laid out purely as offering to the Lakshmi and can not be touched for the entire year. A book of prayers is also read from. The image attached depicts a standard setup for such a tradition. My thoughts: The interviewer used to take part in this ceremony and remembers it as a very regimented tradition. Certain rules must be followed at all times, and the marking of money to be set aside for the goddess is strict in kind and in variety. In the Hindu religion, prayers are an extremely integral aspect to daily life. Hindu people attribute every organic substance as an embodiment of God, and as such, we should give thanks as much as we can. The informant, D, asked his religious father, M, about a set of prayers he remembers having to memorize as a child but since then has forgotten. These three prayers are some of the most central to the daily prayers a devout Hindu can practice, called the Trikal Sandhya. These three prayers seek to answer why we wake up in the morning, how we digest food, and how we sleep at night. Tvameva mata cha pita tvameva. Tvameva bandhus cha sakha tvameva. Tvameva vidya dravinam tvameva. Tvameva sarvam mama deva deva. O! Benevolent Mahadev; please, forgive me if I did anything wrong, knowingly or unknowingly, by hands, by legs, by speech, by body, by working, by ears, by eyes or by mind. Let be Your victory. My thoughts: While I am not especially religious anymore, I can appreciate the mindset behind these prayers. Hindus see that the act of getting sleep and restoring energy is a God-sent process. Yagna shishtha shinah santo, muchyante sarva kilbishaihi. Bhunjate te tvagam papa, ye pachantyatma kernat. Yat koroshi yadashnashi, yaj juhoshi dadasi yat. Yat tapasyasi Kaunteya, tat kurushva madarpanam. O! Kaunteya (Arjuna); whatever you do, whatever you eat, offer as a sacrifice. Whatever austerity you perform, do it as an offering to me. Lord Krishna said in Bhagvad Geeta: “I am the fire of digestion in every living body. I am the sir of life, out going and incoming, by which I digest four kinds of food. Om, Oh! Lord, protech and defend both of us together. We should stay together and do God’s work together. Let our knowledge shine and become divine in the world. We should never fight with each other, never get envious of each other and stay united forever. My thoughts: While I am not especially religious anymore, I can appreciate the mindset behind these prayers. Hindus see that obtaining nutrition from food is essential to life, and due to that, it is easily attributable to God. Why Do We Wake Up in the Morning? This particular entry seeks to answer why we wake up in the morning. Karagre vasate laxmi, karmoole Sarasvati. Kara-madhye tu Govindah, prabhate kara darshanam. Goddess of wealth Laxmi resides at the top of palm, Goddess of knowledge Saraswati resides at the bottom of palm and Lord Krishna (Govind) resides at middle of palm and that is why we must look at our palm every morning. O! Mother Earth, who has ocean as her clothes, mountains and forests as her body, who is the wife of Lord Krishna (Vishnu) I bow to you. Please, forgive me as my feet are going to touch you. I salute Lord Krishna, the world teacher, the son of Vasudeva, the destroyer of Kansa and Chanura, the supreme bliss of Devai. My thoughts: While I am not especially religious anymore, I can appreciate the mindset behind these prayers. Hindus see that they must treat the Earth as if we are its guest, and this prayer intends to thank God for letting us step on his creation. Informant: P, the interviewer’s mother. She grew up in India and speaks Gujurati fluently, the language of origin of this proverb. Fluent speakers like herself still use proverbs in daily life whether in conversation or merely in passing. Her parents’ generation is still heavily accustomed to the concept of arranged marriages, and she told the interviewer this proverb about marriages and finding proper suitors that her parents frequently tell their daughters and nieces. This proverb tells young girls that if they even have a speech impediment, something unpreventable on their behalf, they should not speak, lest they lose a potential suitor they have been primed to marry. The interviewer has a few things to say about this proverb. First and foremost, he believes that in this day and age there is very little need for arranged marriages, and the importance Indian society placed on them 50-60 years ago has certainly died down a bit after an era of migration to America and becoming aware of American ideals. This dilution isn’t a bad thing, either. Objectifying things such as stuttering place a false sense of ideals in growing minds, especially those that are just beginning to form their own impressions of the world and themselves.